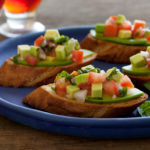 Crostini are the perfect go-to appetizer. 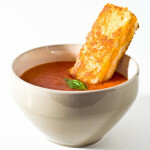 You can prepare all of the ingredients before hand and assemble right before the guests arrive. 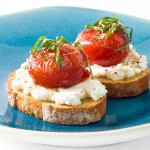 Rich roasted strawberry tomatoes tossed in balsamic vinegar are perfectly sweet against creamy ricotta. Risotto is warm, hearty, and filling. 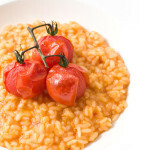 Roasted cherry tomatoes give this risotto a pretty hue and a rich satisfying flavour. 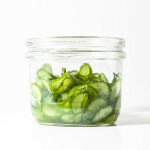 Mini cucumbers taste great on their own, but quick pickle them in a simple brine and you'll be blown away by the flavors. Cut the cucumbers as thin or as chunky as you like; thinly sliced cucumbers taste more delicate, while chunkier slices make for a more satisfying bite. Serve these cucumbers alongside a seafood dish or any meat dish that needs a bit of freshness.